The Falkland Islands held a certain mystique for New Zealand DXers, it resided not in the South Atlantic but on the ‘top shelf’ with Tristan da Cunha, Greenland, St Helena and other prized DX catches. 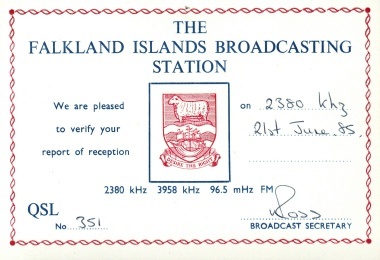 Though there was some doubt that given it’s operating schedule in the 1970’s, the Falkland Islands Broadcasting Station (F.I.B.S) would ever be heard in New Zealand. Best reception from neighbouring South America here in New Zealand is from a few hours before our sunset till their sunrise and the Falkland Islands regular broadcasts were well after our sunrise! The F.I.B.S. broadcast on 536kHz MW with 5kW and 2370kHz with 1kW, from 2230 – 0200z (1030a.m. – 2p.m. NZT) Mondays to Saturdays and 2200 – 0100z (10a.m. – 1p.m. NZT) on Sundays. Could a 120 meter-band frequency propagate to New Zealand at that time? Given exceptional conditions, a trans-polar path was possible and in the mid ’70s weak audio was traced on their frequency. A hopeful letter was sent to the Falklands but nothing conclusive eventuated. In April l978, the F.I.B.S., used one of two airport transmitters on SW 2370. It was a Redifon Granger unit rated at 5kw. When first put on the air by Cable & Wireless, it was operated at just under 2kW,and there were apparently no plans to use it at full power. The antenna was a horizontal log-periodic, beamed at about 320 degrees. Chances of reception in New Zealand remained slim… then fate intervened.. The Argentine forces then took over the F.I.B.S. facilities and used the slogan “Radio Nacional Islas Malvinas” which included two daily English transmissions. “First of all, our role during the occupation was trying to keep our population informed as much as possible of events in Stanley. . . where obviously the Argentine Governor and his staff were based. We considered this was in the interests of the population, as opposed to just walking out. Radio Nacional of Argentina sent several civilians to work with us, and the station became known as LRA 60 Radio Nacional Islas Malvinas. A charming chap called Norman Powell was my equivalent… he was so scared of the Argentine military…it was untrue. Unfortunately, one or two of the others were not so sympathetic and we had a number of upsets over who was running the station. I had been told repeatedly by the Argentine administration… that I was to remain as Station Manager. News output was restricted mainly because Powell had his versions of the happenings coming in from the Argentine sources, and I had mine from the BBC World Service and…on occasions… first hand accounts. We generally compromised, and read very little. I read in English… and he in Spanish. The transmissions were extended with propaganda programs, prepared in Argentina, and transmitted for the troops over the transmitters. On 1 May…. British planes bombed the airport at Stanley and the transmitters were closed down. They were only re-opened for a few hours to rebroadcast.., to Argentinean troops… the Pope’s address which he gave when he visited Buenos Aires. Just before the bombings, the transmission times were cut back and we were closing down at 6:00 pm local time as they feared the British would home in on the frequencies. Powell went back to Argentina a week before the air raids. He was quite naturally afraid of what might happen. . .and made one or two lame excuses, promising to return… which he never did. Unfortunately, Ernest Dalmau the engineer, was made of sterner stuff and stayed almost until the final surrender… still throwing his weight around. A young lad, Fernando, also disappeared a few days before the surrender. Television was established, using the Argentine system… .and canned programs brought in from Buenos Aires. Locals watched the football matches, but little else. TV sets were sold for $200 with a down payment of $40. Most people only paid $60 in all. However, the system is not compatible with the British system. . .so the sets are of little use now. Since September, we have had B.F.B.S. personnel working with us at FIBS. Almost immediately after the conflict ended, using our small staff, we extended from 6+ to 10+ hours a day. ..broadcasting programs for the British Forces. After their staff arrived in September, we further extended to take in the Breakfast Show and an Afternoon Show. . .totalling now 16+ hours broadcasting a day. The Ministry of Defence installed a VHF transmitter on 96.5 mHz FM which has a radius of about 30 miles. We lost the 536 kHz mediumwave transmitter. ..which was very old anyway. I believe the Argentine troops kept it switched on at night as well as during the day.. to keep warm., and damaged the valves. The antenna system was destroyed also. We now broadcast on 3958 kHz until 4:30pm local time each day, changing to 2370 kHz from then until closedown at 10:30 p.m. local. Not only did the F.I.B.S. provide a target for DXers, but other transmissions soon eventuated. On 9 April, listeners at Convention 82 held at Tiwai, identified a point-to-point transmission in Spanish between Argentine military forces occupying Port Stanley and Buenos Aires, and this was heard on a frequency of 24146 kHz during the early hours of the evening. Argentina increased broadcasting hours on their own SW outlets as a result of the invasion. The Argentine Ministry of Communications gave domestic broadcasters special permission to use SW to broadcast to Patagonia and las Islas Malvinas. 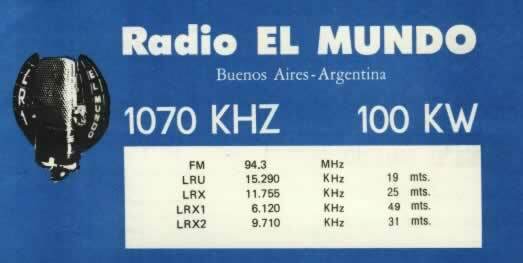 R.Continental, Buenos Aires was heard on 6060kHz, Radio El Mundo on 6120kHz, Radio Provincia de Misiones Pasadas on 6160, (noted being severely jammed on occasion and with an English newscast at 2230 for British ex-pats and seamen. Radio Rivadavia surfaced on 9690, sharing the frequency with Radio Nacional. RAE also spared time on 11710kHz for use by Radio Del Plata. The BBC increased broadcast hours towards the Falklands from the Ascension relay site and the British Forces Broadcasting Service used Ascension facilities for broadcasts 3 days a week. An anti-British, English-language station “Radio Liberty” was broadcasting on 17740 kHz and believed to be located in Argentina, although there was speculation that Algeria was the host. It claimed “The whole world is in solidarity with Argentina” In the fashion of ‘Hanoi Hanna’ and ‘Tokyo Rose’, ‘Miss Liberty, The Buenos Aires Belle’ hosted programs. And the British government took over one of the BBC’s transmitters on Ascension Island to enable the Ministry of Defence to broadcast “Radio Atlántico del Sur” (Radio South Atlantic) in Spanish to the Argentine troops on the Falklands. According to a BBC correspondent in Argentina reporting on this propaganda radio, it is unlikely many soldiers were listening because it is thought they did not have shortwave radios. Tony Marr was the first to report a QSL from the broadcasts. A very friendly letter received via Foreign & Commonwealth Office in 3 weeks from Mr. R. Hunt Governor of the Falklands; expressing his amazement at their signal having been heard so far away during that “memorable night”. Offer of a copy of tapes of the 4 hours of the invasion heard here was turned down as a number of tapes had been recorded locally. He promised to deliver report to F.I..B.S. upon his return to Port Stanley. And John Durham secured a verification from the Argentines for “Radio Nacional las Islas Malvinas”! A usual RAE Cd with map of Las Malvinas stamped on. They also sent a tourist pamphlet on the Southern Lakes and Spanish booklet on ‘La Política Británica y Nuestras Islas Australes’. When the hostilities concluded, the B.F.B.S. maintained a SW broadcasting presence on the Falklands and reception of the islands was relatively easy. Reception was readily possible from sign-on with a Breakfast Show program commencing at 0859 GMT on the frequency of 3958 kHz with just under 2kW. The carrier was heard from as early as 0600 GMT, and full station identification given at sign-on, also mentioning an FM outlet on 96.5. Relay of BBC News followed at 0900 and Review of the British Press at 0910. Local weather at 0915, then into the new program with professional sounding DJs and the latest in British pop music. Frequent announcements mentioned island activities, and an apology was heard for inconvenience caused by RAF and British Army exercises at Port Stanley Airfield. The programs were designed to entertain British forces as well as local residents. First reception was noted mid-February by Tony Marr. With the new mid-evening time slot coinciding with peak reception from the South Americas, even the novice DXer had an excellent chance of hearing the previously most elusive of exotic stations. Staff were under contract and included announcers from the BBC and at least one ex Radio New Zealand DJ. So many reception reports were received from New Zealand that regular calls to New Zealand listeners were made, and dual time checks heard “It’s 6:15 am in the Falklands and 9:15 pm in New Zealand”. The F.I.B.S. was a part of the Falkland Islands Government. It had a fulltime staff of 2: Patrick Watts and Claudette Mozley. Patrick was awarded the MBE for his work during the conflict when he kept the station on air and provided an information service despite the presence of Argentine soldiers and officials in the studio. During the 1st and 2nd of April 1982 he had the unhappy task of commentating on the invasion of the Falklands. Claudette Mozley was the Broadcasting Secretary, and has her own highly popular program every weekday from 10 till 11 (Stanley Time). Born and raised in the Falklands, she has spent several years living and working in England. The station had a dedicated team of part-time announcers who kept the programs on the air in the evenings and at weekends. Len McGill, Brian Paul, Gavin Short, Michael Smallwood, and Vicky Townsend all gave up their free time to help make FIBS the friendly station it was. Jeanne Sheridan was our part-time librarian, sorting out the extensive library of records and coping with the new inflow of records from BFBS. Two additional program staff and a broadcast engineer, were attached to FIBS from the British Forces Broadcasting Service. The B.F.B.S augmented studio facilities. Two studio kits were dismantled in London and flown to Stanley, thus re-equipping the existing FIBS studio, and creating a new one. The SW transmitter on 3958kHz, was destroyed by a hurricane in July 1989 and wasn’t replaced. MW broadcasts were also terminated and replaced by FM though in September 1999, a new 15 kW transmitter began operating on 530kHz. And more recently, the transmitter at Bush Rincon on 550kHz has also returned to the air, carrying programming from the B.F.B.S.